At Vic Mix we believe it is wrong to accept injuries and occupational illnesses. We believe injuries and illnesses are not an inevitable or expected consequence of doing business and we are committed to eliminating these tragic events. It is the right thing to do and imperative for our business. This is our vision and goal. The essence of this ideal, is people looking out for each other and ensuring we apply the same standard of care to others, as we would have them apply to us. Furthermore, this goal should not be restricted to our employees, but must also include our families, contractors, vendors and the communities in which we operate. 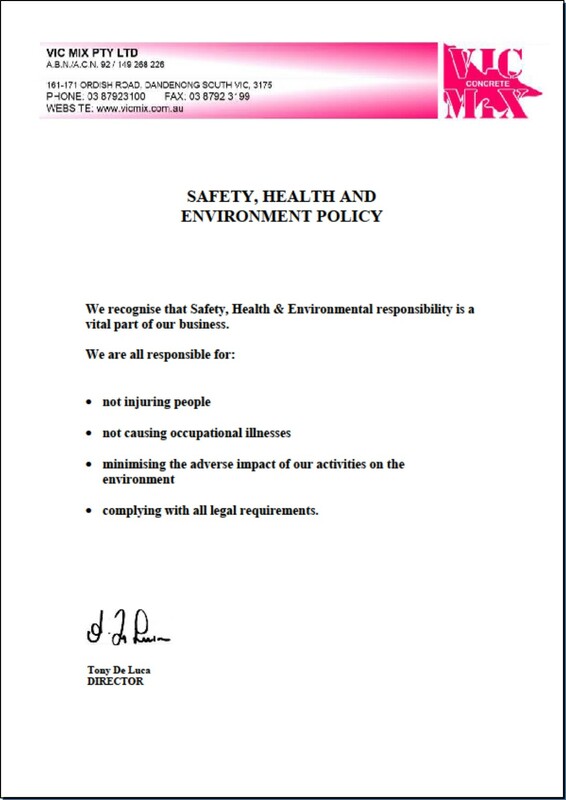 Below is a copy of our Safety Policy along with the Warning that appears on our Delivery Dockets and below that is the material Safety Data Sheet (SDS) for Pre-mixed Concrete. Please note, direct contact with wet concrete may irritate your eyes and skin and may cause extreme dermatitis or chemical burns. Click here for more information on Chemical Burns. When working with wet concrete: Direct contact with wet concrete may irritate your eyes and skin and may cause dermatitis and chemical burns. Wear protective clothing, gloves (AS 2161) and eye protection (AS/NZS 1337). Hardened Concrete: If you cut, drill, saw, route, chase, sand, grind or break up hardened concrete, silica dust may be released. Breathing silica dust over time may lead to lung diseases including bronchitis, silicosis and lung cancer. Wear a P2 dust mask (AS/NZS 1715/1716) and eye protection (AS/NZS 1337). To stop dust build up, regularly wet and sweep up or dry vacuum and put dust in a covered container – wear protective gear. Follow local authority guidelines for getting rid of waste. See our Concrete Material Safety Data Sheet (SDS) for details, call (03) 8792 3100. A Safety Data Sheet (SDS) is a document that contains information on the potential hazards (health, fire, reactivity and environmental) and how to work safely with the product. Please download (PDF file) for the safe use and handling of Vic Mix Pre-mixed Concrete Products. In accordance with the Code of Practice for preparation of this document, it must be reviewed and re-issued at least every 5 years. If you find the downloaded document does not comply with this requirement, contact our office immediately and we will make arrangements to supply you with a compliant document and update this website.